This post continues the Top Ten Things Not to Do with a historical background. 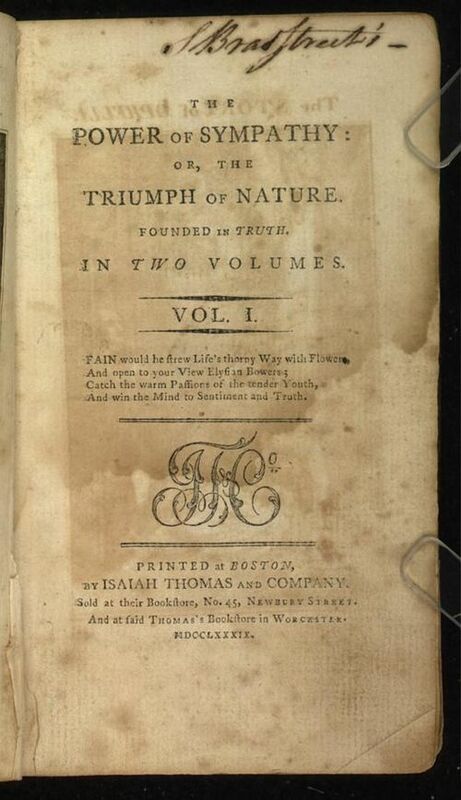 Today is the 230th anniversary of the publication of the first American novel. Its title was “Power of Sympathy,” and it was written by William Hill Brown. If you were there when this event happened, there are some things you should not have done. In case you have a time machine and plan to go here is a list of the Top Ten Things Not to Do to keep you out of trouble. Despite them all being great (as usual), my favorite is number 3. Thank you, GP. Looks like the majority view. I will carry your list around with me at the next reading I attend. Everyone in “Women Who Write,”a state wide group in NJ, has aspirations of being the next great, best selling author. Your advice will come in very handy! Thanks, Ronnie. I hope it keeps you out of trouble. Have to agree with GP. 3 really strikes a chord with me. Some things never change. You know what would be a good follow-up to this list, John…wait, is that Tiny? I think I’ll be going now. 57 years before baseball? That must have been a glorious time to be reading. Of course, it was also about 90 years before electricity. Oh well. I guess that is the reason. Thanks, Gwen. Wait a minute. In a duel, I get the choice of weapons. I choose dry-cured salami’s. No way, your little potato bites. So many of these sound familiar, John, lol. I had no idea! I bet that first edition is worth at least nine dollars now. Ha haha. I’ll bet so. Maybe even nine-fifty. Thanks, Susie. Great list, as per usual!! Wonder what that 9 shillings is worth today? Yes, I know, I could look it up…ok, I did…without taking up my whole morning, 9 shillings in 1790 (would not let me choose 1789) would be worth £34.54 in 2017 (couldn’t get it for another year) which equals $44.40 US… quite the bargain in today’s prices, eh? Yes, a bargin for sure. Thanks, Dale. Thanks for the warning, John. As a time traveller, I may avoid 1789. However, if I do visit, I may pick up a signed copy of the book, but I won’t ask why there aren’t any coloured pictures in the book or tell the author that it’s missing an ISBN on the back cover. And, if I mention selling it on Amazon, I will agree that there is a market for books in the Amazon. Nine shillings huh? I’ll remember not to ask if there’s a Barnes and Noble club member discount . . .
And the dunking chair SOUNDS like a great time, but it lies. And no, I’m never going to admit I dabbled in witchcraft to these peeps. I have no desire to be a human s’more. Great history lesson in ten easy steps Boss! Thank you, Marc. Fun too. Wow, John. This is an extra-cool bit of “this day in history” — love it. The image of the book interior is icing on the cake. And so true about the cleaver. LOL. HaHa, things haven’t changed much, have they??! Oh my! I can just imagine the reaction to the question about Kindle. 🙂 Fun ones, John! Nothing has changed in 230 years! Spouses are still asking you when you will get a real job and everyone is still giving out plot ideas. I’ll have two bookmarks please, one for my friend. Loved this as always, my friend. Writing is soooo easy. I love that quote from Ernest Hemingway “There is nothing to writing. All you do is sit down at a typewriter and bleed.” With a little assist from Tiny of course. Ha ha ha. Sounds pretty typical. Thanks, Linda. Tiny expelled from empathy school, explaining Kindle and avoiding being a witch, and the New York T shirt. That’s a hat trick of hilarity, John. Thank you! Haha, John. Number 10 might help the author with Number 9 though. This is going to come in handy when I finally finish that time platform, John. Though I suppose if I did ever complete it, I’d already know about it, wouldn’t I? Okay. Here my take on this post. Unless I missed something, we’ve come a long way since those days. Nowadays we put the author’s name on the cover, and I’m impressed that you knew we still used shillings in 1789 (I didn’t). As usual you have reduced the post to its essence, Andrew. Authors on the cover. Yes, the resarch came up with shillings. I too was surprised. I would have thought we had thrown off the monatary system of the oppressive monarchy. Which makes me wonder when the penny, nickle , dime , quarter, and dollar stuff first stared to be used. Well the answer is, after the establishment of congress the system was established but no one used it. It wasn’t until before the civil war that the system was accepted throughout the country. Phew. Glad to know that information. Thanks for the comment. I know TMI in my answer. Thank you for th elink, Traci.